Are you short on storage space? You may have much more space available to you than you think! 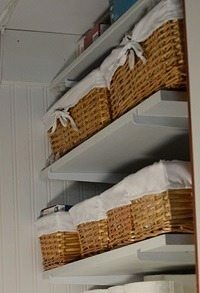 Here’s how an underused closet was revamped into a pretty and useful storage closet. Freelance writer, blogger, DIY enthusiast, gardener and animal lover. Anne began blogging about her DIY adventures when she bought a 1930s fixer upper home and her first set of power tools. Follow the fun at Design Dreams by Anne!